Historic photos can be delivered on March 20, 9 a.m. to noon; and Saturday, March 21, 9 a.m. to noon. It has been 375 years since a group of settlers from Ipswich led by the Rev. John Ward journeyed nearly 20 miles to the northwest and founded Haverhill. The Eagle-Tribune and Haverhill Public Library plan to jointly publish a coffee table book to commemorate the city’s 375th anniversary, and are looking for historic photos of the city. The heirloom quality, hardcover book is being designed to capture the heritage of Haverhill through images dating back to the days of the horse and buggy. The Eagle-Tribune is giving readers the opportunity to participate in this project. Historic photos will be scanned during two sessions at the public library, 99 Main St. — Friday, March 20, 9 a.m. to noon; and Saturday, March 21, 9 a.m. to noon. The photos should be of general interest, portraying commerce, industry, transportation, rural life or public service. 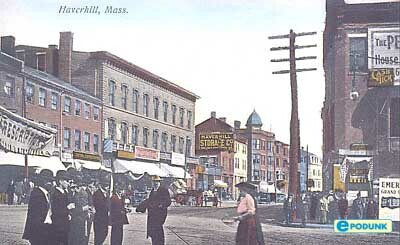 They should have been taken in Greater Haverhill between the 1860s and the present. The photos should be original, not newspaper clippings or photocopies. Each photo should be accompanied by a submission form. Forms can be downloaded at Haverhill.PictorialBook.com. There is a limit of 10 photo submissions per family. Private collectors are asked to call 360-687-6731 to arrange an appointment.